It’s not because of the “gifts” that I supposedly get from the government, if we are to believe the recent confidential statements by Mitt Romney. Luckily, I have not needed the government very much in my life (so far) except for the blessings that good government brings to all the people – a terrific public education that lifted me to places I never thought I would go; safe streets and fire protection; clean drinking water and wholesome foods; confidence that my country would not be invaded and occupied by hostile armies. The reason I am a Democrat is simple: on balance, over the long haul, the Democratic Party has been the single most effective agent for progressive change in America. No, the party is not perfect. We have our own problems. We have our own corrupt and hypocritical leaders. Some Democratic leaders pander; some are slow to lead; a few are corrupt bozos. Democratic administrations sometimes screw up. Some Democratic voters do indeed have their hands out. Needless to say, the Republican Party, as an institution, has resisted each of these long, broad campaigns to recognize the essential humanity of all people and to ensure their rights under law. The issue is not handouts; it is dignity, decency, personal rights, and global peace. And it’s not as though the Republicans don’t give out “gifts” to their own constituents. If we are talking about political parties that use government as a source of giveaways to their supporters, I would say Republicans do not make such a charge with clean hands. Republicans spend vast amounts, for example, on defense contracting (even more than the generals ask for). Through tax breaks, they reduce the effective tax rate on many rich Americans to a level below that of the average worker. Through tax expenditures, they subsidize agribusiness, the fossil fuel industry, and a host of other businesses that donate to Republicans or hire lobbyists to look out for their interests. This is the activity that progressives denounce as “corporate welfare” – a charge that many Republicans seem not to even acknowledge. All that said, I am happy to grant that there are many issues where reasonable Americans can disagree. I will even stipulate that most Americans love our country and have its best interests at heart. –Should taxes be a little higher or a little lower? –Should government be a little bigger or a little smaller? –Should we pay our public bills now or later? Those questions define the bulk of what we in this essentially conservative, centrist society argue about when we engage in politics. Does anyone seriously think we could not solve those problems if we really put our minds to it? If Mitt Romney does not understand all this, then he never deserved a role in our public life. 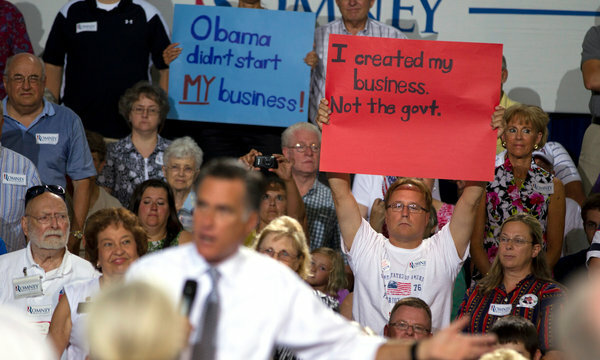 Who are Mitt Romney’s people? How many presidential candidates in U.S. history have ever gotten elected without carrying their home states? A bonus question: who were they? Turns out, of the 44 men who have won the office, only three failed to carry their home state (that is, the one they were living in when they ran for president). They were James K. Polk of Tennessee, Woodrow Wilson of New Jersey, and Richard Nixon of New York. –He was born in Michigan. –He spent the bulk of his adult life in Massachusetts — racking up two degrees from Harvard (when’s the last time he mentioned either of those? Don’t forget: he has a law degree. ), then working at Bain in Boston and later becoming governor. This is the state where he votes. 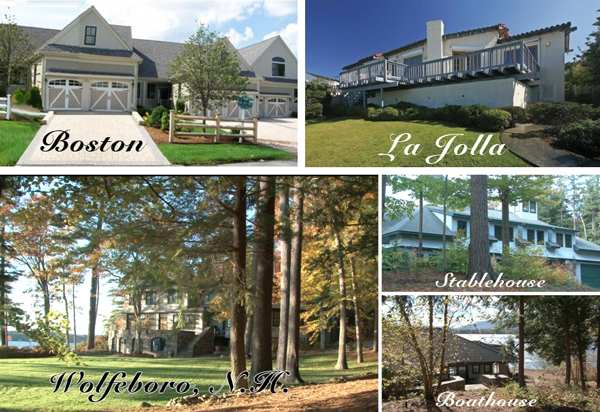 –He also has a vacation home in New Hampshire. –And he is building some kind of pleasure dome in La Jolla, Calif.
Mitt Romney focused Wednesday on President Obama’s remarks about running a business. True enough. But what about those signs? In this case, I cannot find the credit line or caption. I found it at a conservative website that supplied no information about the photo. If you know who took it (or if you took it yourself), please let me know. The president went on to say, “Somebody invested in roads and bridges.” In other words, taxpayers funded the infrastructure. Question is: in that last sentence, what does that refer to? Does that refer to the noun that immediately precedes it? 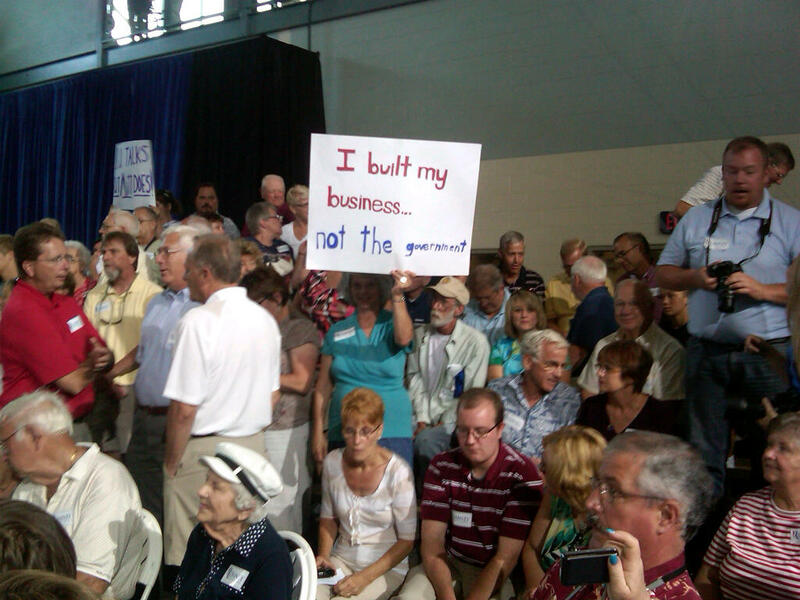 In that case, the president is saying: If you have a business, you didn’t build it. Or, does that refer to the previous concept of “roads and bridges” (in which case, grammatically speaking, the pronoun should be them not that) or the broader point of infrastructure? Personally, I think the president’s meaning was plain: If you run a successful business today, your success is based on the earlier investment in infrastructure. But that’s my personal conclusion. Fox News and Mitt Romney have come to a different conclusion (surprise!) and have chosen to lift one sentence out of context as “proof” that the president is hostile to business. People who use the English language in their professional lives should know how to parse it. “Quote approval”: A new low in journalism? I am a journalist working on a story. I want to talk to you and use the things you say in my story, based on my judgment of what is important. I will use none, some, or all of what you say, as I choose, to further the pursuit of the truth. Whatever quotations I use will be verbatim — nothing added, nothing left out. I will also use your real name (and title, if you have one). This is the essence of the standard known as “on the record.” Journalists prefer it because we believe that, on the whole, it holds people accountable for the things they say. In certain (ideally rare) situations, however, journalists will negotiate some lower standard. Almost always, these retreats from the “on the record” standard come at the initiative of the people we are speaking to. These other arrangements are known by a bewildering array of terms, which do not always mean the same thing in different cities or beats. The problem is that these departures usually serve the source rather than the audience. Today comes word from the Times that political reporters for all the major news organizations have adopted a new — and, I think, pernicious — practice. They allow the people they are interviewing to get a look at their own quotes before publication and censor them. That is, the big shots around Obama and Romney routinely demand and get the power to edit themselves before their words appear in print or online. Well, you can hardly blame them for trying. Who wouldn’t want that option? But the journalists should never have agreed to it. These spokespeople, senior officials, and top aides get paid lots of money for their ability to think on their feet and choose their words carefully. At the very least, having agreed to this arrangement, the journalists have a professional duty to reveal the terms. What about transparency? I, for one, could live without stories in which members of the political class get to “clean up” their quotes. Another question: in what other fields does this practice apply? Sports reporting? Business news? 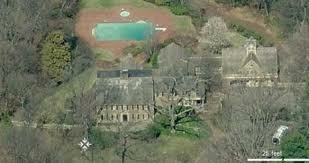 –in how many states does Mitt Romney currently own property (addresses, please)? –in which state is he registered to vote?